The event was pretty well attended, we got there early and there was a line of about 50 people waiting to get in and plenty of people were walking around the show floor but it was not crowded. The camels, from AT&T of all sponsors, was a weird touch and kinda sad since there weren’t that many kids around to ride them. Big name travel personalities Samantha Brown, Peter Greenberg and Pauline Frommer were set to speak that day. Brown was the first up and she drew a good crowd. Unfortunately, the open air “theaters” that were arranged in different corners of the show floor were not conducive to actually hearing what the speakers were saying. The surrounding crowd noise was way too loud for those in the back. In spite of this, Brown did her best and the PBS host was just as charming and funny off screen as she is on. Her best piece of advice – “always bring peanut butter”. We also discussed Chinese tourism briefly with Pauline Frommer, and she was very upbeat about the huge chunk of global travel that the outbound Chinese represent, but curiously, there were no China tourism books at the Frommer’s display. So as a destination, China is not on the top of most Americans’ travel list. In fact, there were only two vendors at the show that focused on Asia, and none were exclusive for China. But the real power of the Chinese tourist is outbound, so what did the vendors have to say about Chinese tourists at their destinations? 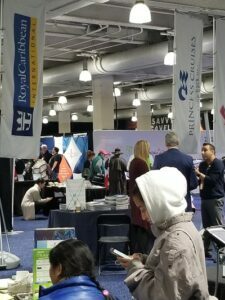 This was our main takeaway from the Travel & Adventure Show – while all of the vendors we spoke to wanted to tap into Chinese visitors and they had Chinese as guests before, they were not actively marketing to them and they admitted they had no idea how to even reach them. For the travel vendors that were destinations or experiential tours in and around New England, tapping into the massive number of Chinese who visit family members at the numerous Boston/New England universities has got to be part of their future growth strategy; and if it isn’t, it should be. Many of the more than 130 million Chinese travelers have done all the typical tourist stuff in the US and Europe, now they want to have unique experiences and see things that are off-the-beaten path. This is a huge opportunity for New England tourism operators, but how do they take advantage of it? They need help to identify and then get in front of the right kinds of Chinese travelers.